Apple Releases Launch Date, More Details for Smartwatch; Set to Become Premier Payments Wearable | NFC Times – Near Field Communication and all contactless technology. Apple said it will release its first wearable, the Apple Watch, next month. Like its iPhone 6 and 6 Plus, the smarwatch will carry an embedded chip to store tokens and encryption keys to support Apple Pay. Consumers with the iPhone 5, 5c and 5s will also be able to use the payments service with the watch, via Bluetooth or Wi-Fi. The watch also supports hotel door-key access, though likely not from the embedded chip. NFC Times Exclusive Insight – Apple’s new wearable, Apple Watch, will support Apple Pay as well as mobile keys for hotel rooms, the company announced Monday. Smart watches have so far seen considerable interest from industry observers and high levels of consumer awareness, though awareness has not translated into widespread take-up among consumers so far. 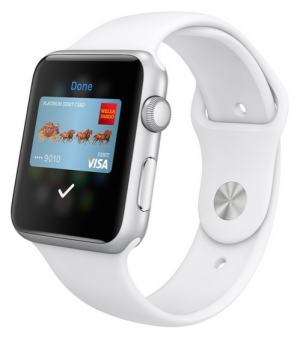 But more payments wearables from other manufacturers are expected, though the field is slender for now. And manufacturers aren’t the only ones introducing service. For example, Australia’s No. 2 telco, Optus, unveiled a proof-of-concept smartwatch that pairs via Bluetooth with smartphones running the telco’s Cash By Optus app. The smartwatch supports a Visa payWave prepaid application. Article has about 1360 words.